Mane shop fronts can transform your shop to give a fresh modern look that will draw in extra custom, remember first impressions count and the first impression of your shop is its shop front. Shop fronts come in a variety of colours and styles that include aluminium and all glass shop fronts, we will sit down with you and design the shop front that meets your needs. Shop fronts come with a variety of shop front doors whether it be a sliding door or swing door, manual or automatic Mane Shop Fronts offer the complete solution. Mane are a small firm with small overheads meaning top quality shop fronts at lower prices than our bigger competitors. 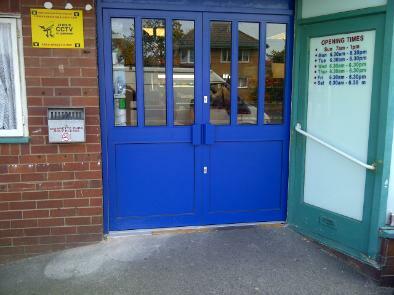 We offer a nationwide installation service on shop fronts and shop front doors, please get in touch for a free quote. Aluminium shop fronts are strong and light with anti corrosive properties unlike wooden shop fronts that rots and plastic that breaks up over time. Aluminium shop fronts last for many years and is very easy to maintain. 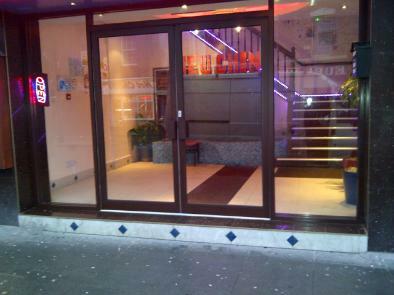 Aluminium shop fronts give a class and modern finish. Mane Shop Fronts can often give a no obligation quote for shop fronts either through a quick phone call or send us your requirements by email. If our quote is within your price range Mane will attend site and carry out a site survey making sure we meet all our customers needs, our survey-er will then make up a scale drawing of your shop fronts which will be sent the customer to approve. Mane Shop Fronts cover the whole of the UK for fitting and maintaining shop fronts our products are second to none and our prices are very competitive so give us a call on 01613209322 or email us neil@manedoors.com for a free quotation. All shop fronts come with a 2 year guarantee. Mane carry out repairs to shop fronts and can replace locks for shop front doors, change door closers, change floor springs, solve hinge problems and service for shop fronts doors. Mane carry out repairs on glass shop front doors, metal shop front doors or aluminium shop front doors in the North West, Yorkshire and North Wales. Please call or email us for a free quote on all shop fronts repairs, we will be able to tell you what the fault could be and a price for repair by you simply telling us what is wrong with the door.